Portable and Customizable, It’s Everything You Need! Enter it once, and use it everywhere. 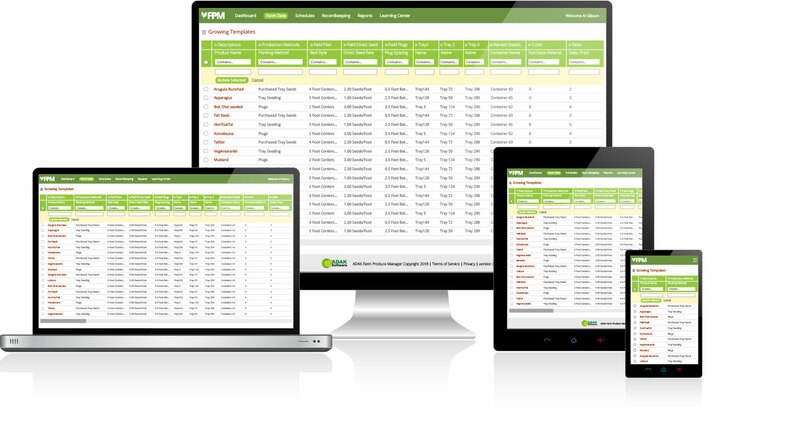 All Farm Production Manager screens reflect the same style and productivity features including spreadsheet like grids for browsing, updating and reporting. Drill down into detailed single record views for granular information, even on handheld devices. Take control of the way you view your data. Unlimited customization of views, including show/hide columns, rearrange columns, sorting, filtering, grouping. 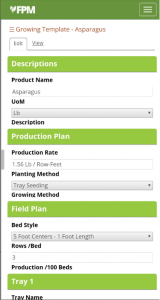 Organize your Farm Production Manager data to work best with your established workflows by saving your custom layouts. Farm Production Manager’s Growing Templates and Schedules feature bulk updating of column data. This feature allows you to update multiple rows all at once by simply selecting the rows you want to change and then enter your new value one time. 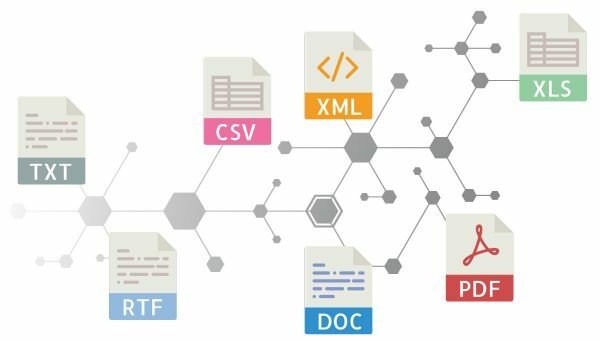 All views and data tables can be exported from Farm Production Manager at any time to popular spreadsheet and document formats such as .csv, .xls, .doc, and .pdf. Farm Production Manager, everything you need. Give up your individual spreadsheets. With Farm Production Manager, all of your data is one cohesive set of data. With detailed workflows and features for every step of your process from planning to planting, scheduling to recordkeeping, and sales to reporting. Explore the feature set below. Product Growing Details Growing Template Definitions Product Identifiers for the things you grow and sell, including all the production information you need to manage the process. Inventory Unit Definitions Units of Measure used when creating growing schedules and planning inventory levels needed to satisfy sales. Locations & Containers Trays More than 6 definitions are provided at startup. Greenhouses Including tray capacity and greenhouse dimensions. Fields Beds are defined on the planting schedules. Containers Container capacity can be different for each Product. Bed Styles Bed Style indicates the preferred/ expected bed width and minimum planting length for a Product. User Defined Resources Resources Including Resource Units of Measure, capacity and other properties. Resource UoMs Resource Unit of Measure name values. Connect Resources To Growing Templates Relationship between Growing Templates and Resources. Utilities Map Your Farm Draw and save the locations of Fields, buildings, features and any other objects located on your farm, on a Google map. Export Data Export any data to spreadsheet format, PDF, or text formats including Microsoft Word and notepad. In Process Feedback Tray Growing Enter unlimited progress notes. Record Lot Numbers for every Milestone. Field Growing Enter unlimited progress notes. Record Lot Numbers for every Milestone. Harvest Picking Enter unlimited progress notes. Record Lot Numbers for every Milestone. Harvest Estimates Enter unlimited progress notes. Record Lot Numbers for every Milestone. Give up your individual spreadsheets. With FPM, all of your data is one cohesive set of data. With detailed workflows and features for every step of your process from planning to planting, scheduling to recordkeeping, and sales to reporting. Explore the feature set below. can save you time and money. but there is so much more integrated market farming software can do for you. Desktops, tablets, mobile devices. All screens have been designed to function on any device in the office, on the road, or in the field. Unlimited customization of the view, including: show/hide columns, rearrange columns, sorting, filtering grouping.